I was only here for a day to study in a quiet place where I could take pizza breaks, but I loved this hostel! The owner is a sweetheart and the place has a real homey feeling. Wish I could have stayed longer, because it was so relaxing! The cacti patio on the rooftop is also very cool. Because the explosion of Etna, our flight had been delayed. Although just staying in Catania for one night, this lovely place make us forgetting all the exhaustion and tiredness. Warm and lively atmosphere, thoughtful and kind household (though we speak different language) , and a local and delicious breakfast, painted a beautiful color for our trip in Sicily. My stay was great. I came to stay a few nights to visit some friends for New Year’s Eve and found the apartment to be large and beautifully decorated. The woman who runs the b&b is very kind and accommodating. The only small issue was that the apartment seemed rather chilly. I’m not sure if maybe the city isn’t used to the cold weather but it was a bit cold. Overall I recommend this place if you’d like an accommodating host and a wonderful terrace view. Very good value for money, with a fine view. Very pleasant. 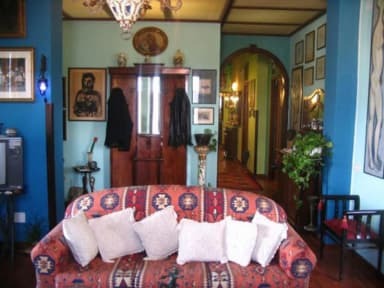 As others have said, the b&b is a great experience in itself and Eleanora a great hostess. The shower needs work. Nonetheless a good place to stay in Catania. 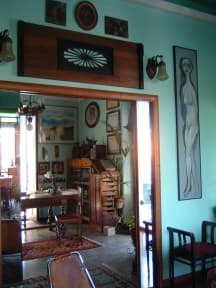 A very pleasant stay at Sirtanus, especially thanks to kindness of Eleonora and her advice. Also great breakfast. The view to Etna from the terrace is amazing! Recommended. Super lovely owner. House was absolutely stunning - very bohemian. Comfortable bed. Shower is no good.